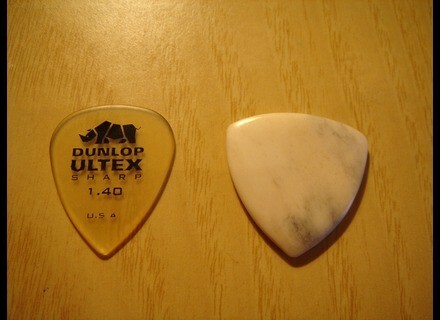 Bone guitar pick, Guitar Pick/Plectrum from Rocky Mountain Slides. Vehuel's review (This content has been automatically translated from French)" Excellent!" This pick I took is polished bone, triangular in shape, with sharp edges. This is the thickest of 3 (see pick horn and coconut), although it is not super large either (1.7 to approximately 2mm). 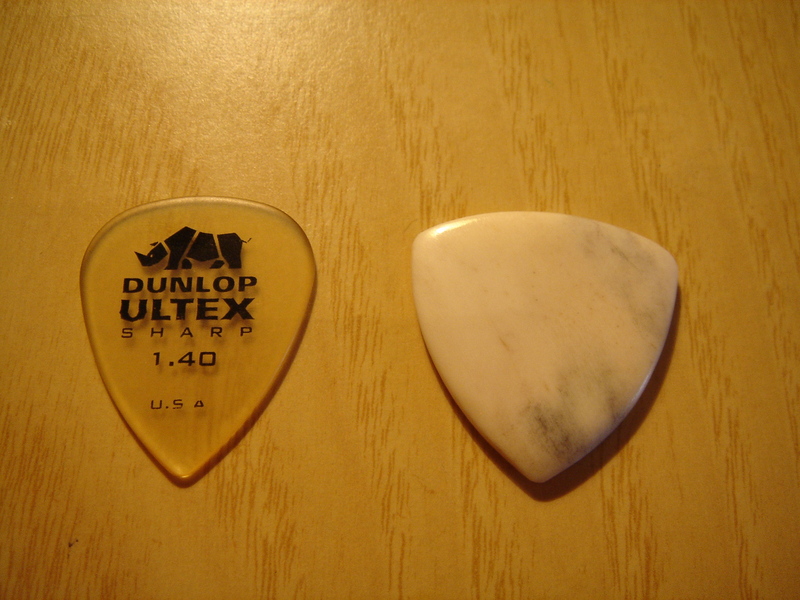 This pick is probably the most comfortable despite the three forms (which I'm not used). The material provides a natural grip that keeps it eludes us without hands. The appearance is nice too, is pretty well done, very nice aspect of the material. The edges are sharp, and combined with the hardness of the material, it can play fast and accurate, and resistance to wear. In contrast, the hardness of the material, do not offer all the nuances right hand possible with the pick horn. Its level, which appears to us directly at the hearing is the attack, which is more noticeable among the three materials tested. This attack is very snapping is the material that offers the most slamming. Similarly, this pick gives more power and boosts the overall volume of the instrument. The spectrum is evenly distributed, although it increases a little more medium / medium low. This pick, with its "surplus" of volume, gives a kind of slight "crunch" to clean what gives less precision to the entire sound, including agreements. Its saturated, it gives the presence of lead but not really color remains neutral with respect to some typical pick coconut. The folk, the attack is still very strong, the sound is open, but very bright. It was a very good volume without force, so much power. This pick is ideal to accompany the song, making sure however to handle the volume guitar / vocals. In conclusion, there is a very strong pick, who has slammed but still fairly neutral (which is not a criticism) except where the distortion found ideal for good hard rock riffs.